There's something about shirtdresses that really floats my boat. Casual, but effortlessly stylish. Practical, yet comfortable. Dress them up for work or roll up the sleeves for the weekend. I recently bought the StyleArc Mara shirt dress after coveting it for ages. 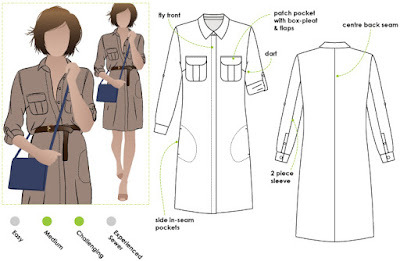 I was trying to justify buying another shirt dress pattern as I already have the Named Wenona pattern, which I love. Now I have made the Mara, I think the purchase was completely justified. This pattern is different in many ways from the Wenona and I love it equally! Before I get into the sewing details, StyleArc are trying out a new service called Gumroad for their downloadable PDF patterns. 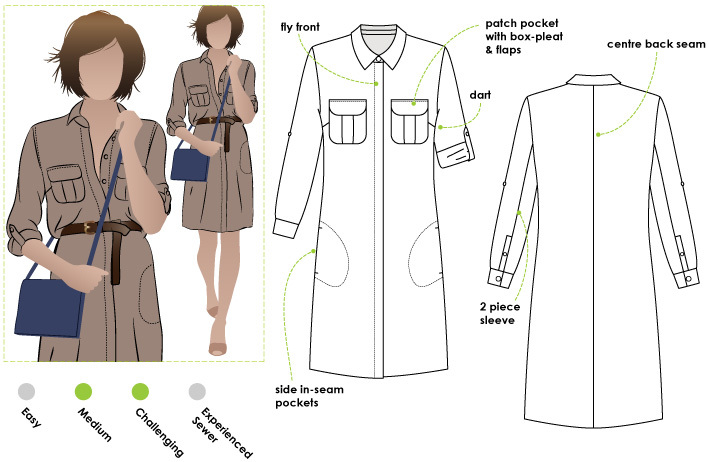 If you would like to buy the Mara Shirt Dress from StyleArc's Gumroad shop, use the code meggipeg20 for a 20% discount on your pattern. How brilliant is that?! I used a double gauze, 100% cotton fabric from Textile Traders for this dress as I wanted something light and cool for summer. It feels lovely to wear and was well behaved during the sewing process. The pattern had quite a few printed pages, but wasn't difficult to put together using my new and improved, super-duper-PDF-cutting-and-sticking method. 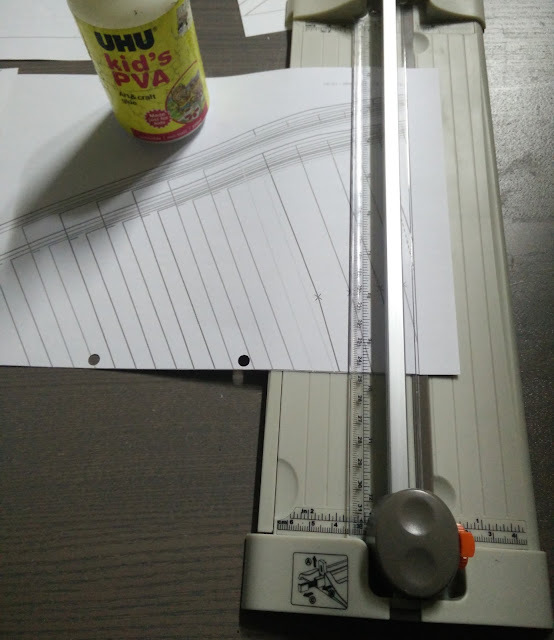 I received a mini-guillotine for Christmas (it was on my list, along with a tailor's ham), which I use to line up and chop the margins on two sides of my pages. So quick and easy compared to the ruler and scalpel method I was previously using. Then I glue the pages together with PVA glue stolen from my son's school supplies. This glue sticks much better than a glue stick, which tends to come unstuck after a while. The other thing I do (thanks to a tip from Carolyn) is separate out the pages of large pattern pieces before assembling them as then there are fewer pages in each glued section and less room for skewiff error. The Mara dress has several attractive features, including pleated breast pockets with pocket flaps, side pockets and a placket to hide the front buttons. The cuff is very nicely designed and has a button on the cuff itself and another in the opening (I forgot to take a photo of that). The shape of the dress is flattering and fairly close-fitting. I really liked the fit and didn't adjust the side seams at all, or anything else in fact. Here it is without a belt. The instructions are minimal for this pattern and assume a reasonable level of sewing expertise. I found myself avidly studying the diagrams and text in a couple of steps to work out what was required, but nothing was insurmountable! I love this dress and will certainly be making it again in different fabrics for a completely different look. Don't forget to use the code 'meggipeg20' if you want to buy it for yo'self! I think it's only valid for 30 days, so get on it. 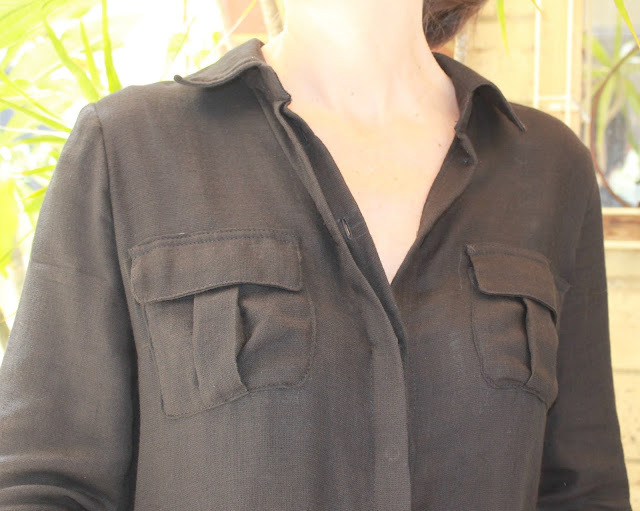 Love this Meg, now I'm yearning a shirtdress too! Lovely shirtdress! This pattern has some really nice details and your fabric choice was perfect. My mum had a Vogue designer shirt pattern with pockets like that back in the 70s. I made it up twice and then was so disappointed to learn that she carted all her old patterns off to Vinnies one day. Looks like I could channel that vibe with this pattern. The dress looks great and I can totally see you making it up in something bright as well. I remember those shirts. How terrible that all the patterns went to Vinnies, but I'm sure they went to good homes in the end. Will it make me look as young and stylish as you look in it? With your hot bod? Guaranteed! This looks absolutely fab! You look terrific in black, btw :) I really like the breast pockets, and the dress looks equally good with and without the belt. Great tip with the guillotine and glue too! Thank you Carolyn :) I rarely wear black but I do like it. I love a good sewing tip! I Also love Dress shirts. Both of your patterns look great. The contrasting option for the Named Wenona is beautiful. You look so stylish and elegant, this dress really suits you. I've been using the guillotine, but with a glue stick. I'm going to try the el cheapo school glue. You've really inspired me to make this pattern for autumn - go you! I have three shirt dresses now and love them all! I dont have this one though. I really like yours and the black is smart. It will also look good with boots for winter. Hello, I really like how this dress turned out, looks gorgeous :) Do you think it is possible to make it without the seam in the middle of the back, ie to have the back in one piece only? Also, would your discount code still work so long after? many thanks!